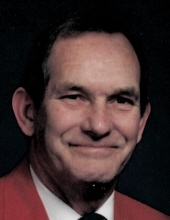 Frankfort – Bill Holbrook, 80, husband of Betty Gilliam Holbrook, passed away on Wednesday, November 28, 2018. He was born in Floyd County, KY on January 16, 1938 to the late Wade and Draxie Osbourne Holbrook. Bill was the owner and body man at Capital City Body Shop and was a veteran of the US Army. He was a member of Camp Pleasant Baptist Church and previous owner of Holbrook Towing. In addition to his wife of 57 years, he is survived by his son, Barry (Carla) Holbrook, Frankfort; his sisters, Sue Sullivan, FL, and Nita (Phil) Pollard, FL; his brothers, Carl Holbrook, Frankfort, and George Holbrook, Winchester; his grandchildren, Wade Holbrook, Hopkinsville, and Cansas (Jonathon) Dixon, Hopkinsville; and his great grandchildren, Paxton, Sadie, Kensie, and Beau. He was preceded in death by his sisters, Maxie Wright and Peggy Parker. Service will be held at 4:00pm on Saturday, December 8, 2018 at Clark Legacy Center, Versailles Rd. Bro. Don Karsner will be officiating. Gathering of family and friends will be held from 2:00pm until 4:00pm on Saturday at the funeral home. In lieu of flowers, memorial contributions may be made to the Alzheimer’s Association or the church of your choice. To send flowers or a remembrance gift to the family of Bill Holbrook, please visit our Tribute Store. "Email Address" would like to share the life celebration of Bill Holbrook. Click on the "link" to go to share a favorite memory or leave a condolence message for the family.